This article – and the two that go with it and that are linked below – was originally compiled back in 2006….whilst it’s interesting from a historical point of view it’s no longer 100% accurate because in the last 10 years plus I’ve learned so much about deliberate practice and the neuroscience that I’ve totally redrafted the 50 Songs list. By all means read the list below, but I highly recommend you click the image below and go and check out the series of articles I wrote starting with The Only 6 Things That Bass Beginners Should Practice! Most of the tuitional material for beginning bass guitarists is pretty uninspirational – you have to wade through a ton of theoretical crap before you get to do the thing you picked up the bass to do – play some tunes! Musical theory has its place of course – if you aspire to any level as a musician you’ve got to know your instrument, scales, harmony, chord theory etc etc. But give a guy a break! When you’re first starting out, you just wanna play some tunes. Here’s my driving analogy – when you have your first driving lesson the instructor doesn’t pop the bonnet (hood if you’ve browsed here from Stateside) and show you the parts of the engine and explain how they interact to produce the energy that powers the car. Later on – when you can drive – if you want to learn how the motor works and get your hands dirty you can. Most of us don’t ever bother – we’re content just to cruise along. And it’s probably the same for prospective bass players. We just wanna play the damn tune! This approach was a happy accident of three ideas meeting at the same time. Idea 1) I’m buying my eldest son a bass guitar for his 5th birthday and was thinking about what I would actually teach him. Being 5, his boredom threshold is going to be low so I’ve got to teach him in short spells and teach him things that he will enjoy and keep him interested – ie tunes, not scales! He loves listening to music and already has an appreciation of different styles: current favourites The Feeling, Queen and Lily Allen, but not averse to hearing some Muse and Rush! Idea 2) A son of a friend had just started to play bass and was looking for a teacher. Let’s call him Tait – after all that’s his name! Tait gave me a call and I asked him a question: “What are you playing the bass for – what are you trying to achieve?” Tait’s answer: “I want to play in a band with my friends.” When asked what kind of tunes they are going to play he mentioned bands like Queens of the Stone Age, Linkin Park and Muse. Eventually I get some some specific song titles from him – all Muse tunes – HYSTERIA, STOCKHOLM SYNDROME and TIME IS RUNNING OUT. At this point I knew of Muse, but wasn’t really familiar with their material. I got hold of ABSOLUTION and gave it a listen. I loved some of the stuff but realised that songs like HYSTERIA and STOCKHOLM SYNDROME were not for the faint hearted! (i.e. beginners!). Idea 3) The final piece of the puzzle fell into place whilst doing some research into Neuro Linguistic Programming (NLP). NLP is a method of personal development and one of the models of advancement that really resonated for me was the idea of setting an attainable goal and progressing towards it in steady, measured steps. How to Play Bass Guitar in 50 songs was born – a great way for bass beginners to start playing some tunes and improve their proficiency at the same time! 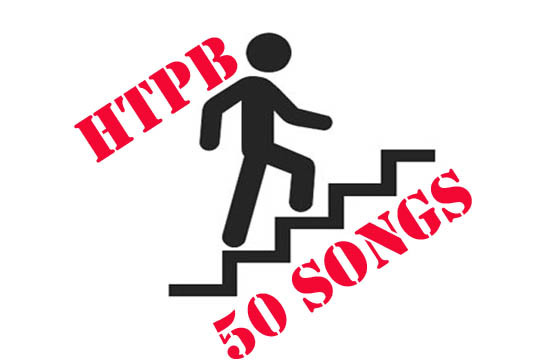 Click here to check out the 50 rock songs that made it onto my list Click here to check out the 50 soul and funk songs that made it onto my list.